As the summers are up and so it is obvious that you need something very efficient to beat the scorching summers. Air conditioners are the best option, but if you are thinking about something in a budget, air coolers will be the great one. 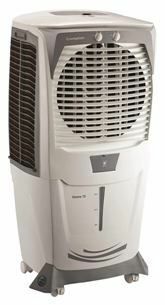 Air coolers are very advantageous as they are very cost effective as well as energy efficient also. One of the best reasons to buy the air coolers is that they are environment-friendly. They do not cause any environmental problems which is a big issue in Air Conditioners. 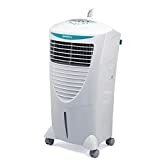 Different types of air coolers are available in the market like room coolers (used for bedrooms, small offices), jumbo coolers (used for large halls, bigger offices), duct coolers (used for central air cooling), etc. based on the area they cool. But the basic principle of working remains the same for all of these air coolers. 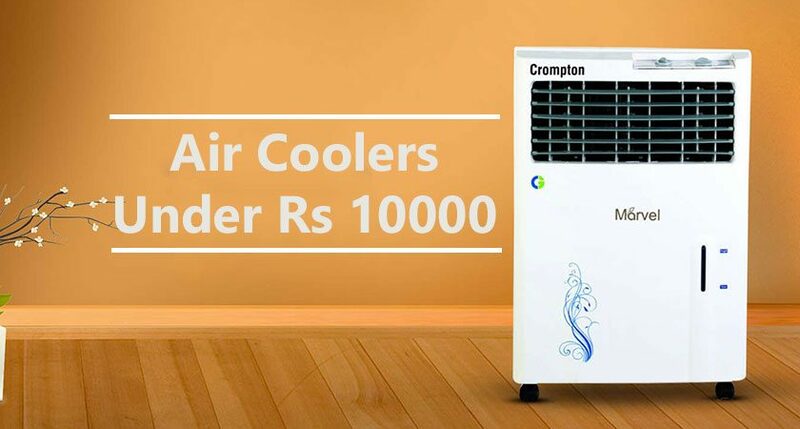 Below is the top selling air coolers in India under Rs 10000 which are listed on the basis of their performance, build quality, customer review, and rating. This list will, of course, provide you the viable choice. Here is the detailed review of all the above listed models to make your buying decision easier. Bajaj is a well-known brand, and this model from Bajaj is an ideal one for dry and arid climates. Featuring iconic, unique design and style, this air cooler is ideal for big halls, offices, and restaurants. It has a water tank capacity of 40 litres that ensures longer cooling as it comes with continuous water supply system. The castors wheels attached to the air cooler lets you move the air cooler from one place to another. This air cooler has special wood wool evaporative pads, and it is made of attractive, corrosion-free engineering thermoplastic material that ensures its durable performance. This model from Symphony is a compact air cooler for your home. This air cooler is efficient and perfect for your day-to-day use. This air cooler has a water storage capacity of 12 litres. Also, this air cooler has a powerful air throw of 1,000 cubic meters, effectively cooling up any room in minutes. You have the option to manage the speed of the fan as high, medium or low. The model uses dura-pump technology for greater durability with a long lasting life. With honeycomb cooling pads, this air cooler ensures better cooling. Moreover, the compact size of this air cooler and its multi-functional wheels make it easy for you to move this one around the house, from room to room. In case of a power cut, this model efficiently works on an inverter. To prevent dust and insects, this air cooler also has the mosquito and dust protector. This one is perfect for small rooms featuring smart and efficient cooling. With this air cooler, your room can get cooled within minutes. This air cooler has a water storage capacity of 22 liters, letting you don’t refill it at short period of time. The special feature of this model is that it has an ice chamber that ensures extra cooling. The model also uses advanced dura-pump technology with a highly efficient honeycomb cooling pad to absorb heat from the room. 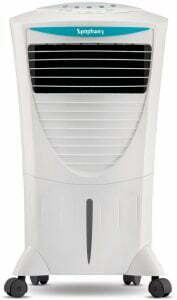 This air cooler comes with a remote control letting you adjust fan speed or to switch the device on/off more easily. For unscheduled power cuts, you can run this air cooler on an inverter as well. 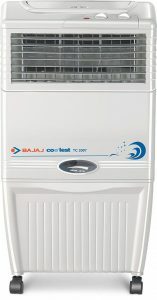 This model from Bajaj is the perfect one to enjoy cool air in summers. 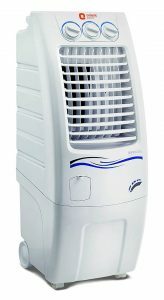 With 34-litre tank capacity, this air cooler is ideal for bedrooms and offices. It has a powerful airflow with air delivery of 2000 cubic meters per hour (peak) per 1200 cubic meters per hour. The model is also equipped with castors wheels, and so you can easily move it from place to another. It’s easy to read water level indicator easily lets you know how much water is there in the cooler. It’s chill trap technology and 4-way air deflection ensure the air is cool and uniformly distributed all over the place. 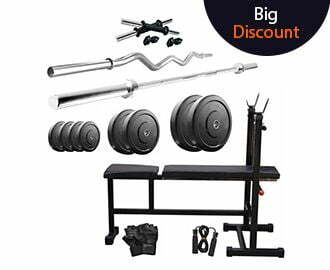 This model comes with the latest state-of-the-art design and also has 3-speed blower control that gives you the option to choose the speed as per your requirement. 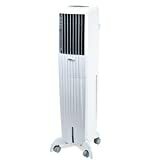 With this Orient Electric Supercool model CP3001H, get that perfect chill in your room and enjoy the winter like weather. It comes with an 8-metre air throw and a motorized vertical and horizontal louver movement. The model comes with a water tank capacity of 30 litres. It is also compatible with the inverter. This model from Symphony is one of the smartest air coolers. With its high intelligence and effective cooling feature, the model is sure to cool a room down in minutes. It has a water tank capacity of 31 litres. This water cooler has a high air delivery rate of 1,750 cubic metre. This air cooler also comes with a high-quality ice chamber to ensure that the water remains cool throughout the day, This air cooler is also featuring humidity control, along with a honeycomb cooling pad. You can control its speed, switch it on/off and also set a sleep timer with the help of a user-friendly remote control. This air cooler from Symphony is a compact air cooler for your home. It has a water tank capacity of 50 litres. This air cooler also has a powerful air throw that effectively helps to cool any room in minutes. You can even manage the speed of the fan with the option to choose between high, medium and low speed. The model comes with a digital control panel and also a remote control. It occupies less floor space and delivers incredible energy efficiency. This air cooler is also loaded with iFunctions. The device has high-quality honeycomb cooling pads for better cooling. The compact size of this cooler and its multi-functional wheels make it easy for you to move it around the house, from room to room. In case of a power cut, the Symphony Diet cooler works on an inverter, ensuring that your house remains cool. The Crompton Greaves Ozone desert air cooler is yet another smart buy for your home to get optimum cooling performance. It is one of the best energy efficient models that keep your electricity bills low, so you can enjoy only the best cooling without worrying about more to lose from your pocket. Its sleek and portable design adds a great charm near your bed, sofa, or dining table. It can store up to 75 liters of water in one go, so you don’t need to worry about refilling the tank frequently. Its amazing wood wool cooling pad design offers improved water retention and better cooling performance. There is also a separate ice chamber to add ice when you need extra cooling. With its inverter compatible feature, you can now enjoy uninterrupted cooling even when the electricity is out. Style, elegance, good size, amazing performance along with incredible cooling is all the features, this air cooler from Bajaj comes with. 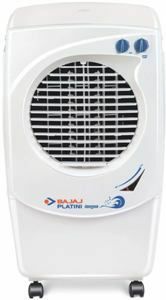 The Bajaj Platini PX 97 Torque air cooler is the best economical option to beat the unbearable heat of summers. Featuring a sleek and compact design, it’s a great addition to your room decor. It comes with a powerful motor and 4-way air deflection system that ensures the efficient and consistent cooling in your room. Plus, the three-sided honeycomb pad offers the fast and extra cooling to your room. For easy mobility, the cooler comes with four caster wheels that make it easy to move from one place to another. It is also featured with the quiet performance that makes you go into a deep sleep without any annoyance. Plus, it is compatible with the inverter so that you can enjoy the cooling even amidst power cuts. Presenting the next air cooler from Hindware that is not only energy sufficient but also great in terms of performance. 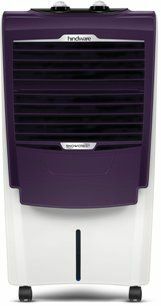 The Hindware Snowcrest 36H is India’s first personal air cooler that comes with changeable color panels. 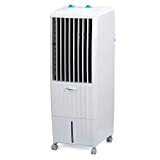 Featuring a graceful white color option along with the changeable color front panel, it adds a great style to your room interiors while providing the cool air around your room. This air cooler comes with a powerful fan and highly efficient motor that ensures higher air delivery in your room to cool it in no time. Plus the honeycomb pads add the balanced cooling in the room. There also comes an ice chamber to enhance the cooling much faster in your room. It is featured with complete shut louvers that resists the dust and insects to enter inside the air cooler and thereby maintains the cleanliness and hygiene. And the best part is that this air cooler is compatible with the inverter that makes it to run even when the electricity is out. So, this is all about best selling air coolers in India below Rs 10000. All these are picked from the well known brands and are listed with both positive and negative customer reviews. So just look at the features, reviews, and specifications of all the above listed air coolers and pick the one according to your preferences and budget.